Halong Bay sits in the northeast of Vietnam, a 4-hour bus ride from Hanoi – in the Gulf of Tonkin. It’s well known for for the hundreds – actually thousands – of limestone islands that rise up out of the water towards the sky. Halong Bay is a UNESCO World Heritage Site and deservingly so. The views are, and the landscape is, very, very impressive. There were countless travel books and sites that recommend Halong Bay as a cannot miss site. 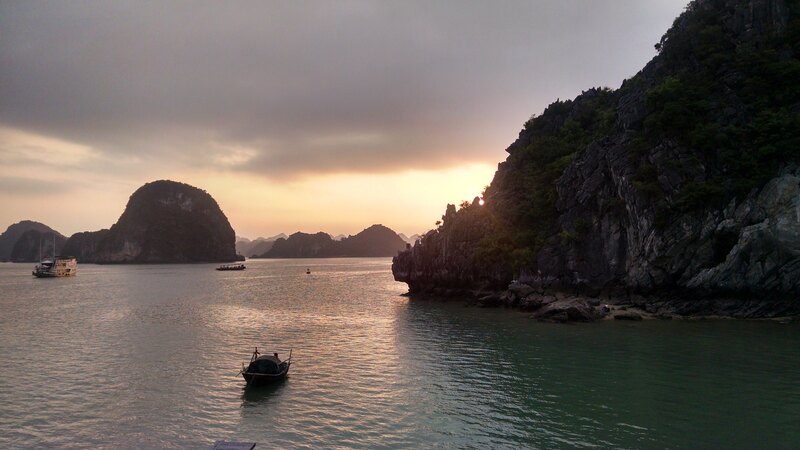 The version of Lonely Planet that Lindsay was reading while in Cambodia had Halong Bay as the #1 attraction in all of Vietnam. Several travelers that we had met while in Thailand mentioned the bay and their stay aboard a “junk” boat. Tangent: The term junk refers to a style of Chinese ship, but can mean simply any ship in today’s world. Calling something a “junk” boat is sort of like calling is a boat boat. 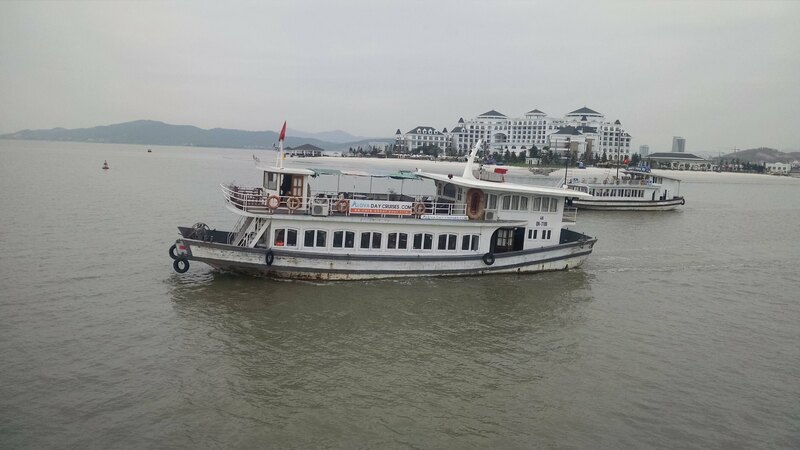 Certainly the boat that we were on does not look or seem to be based on the traditional Chinese junk style boat. Not entirely sure how they came to be known as such. In fact you cannot find the word “Halong” or “Vietnam” anywhere in the details of a Junk (ship) from Wikipedia. Anyways, that is what you do if you want to see and experience Halong Bay. You stay aboard a junk boat that tours the waters and provides a regiment of activities from island hopping to kayaking to a cooking class in the dining room of the boat. Sign us up! The truth is that the bay is incredibly beautiful. It’s also packed with boats, tourists and garbage in the water. The towering limestone islands are unlike anything I have seen – and according to more travelled travelers, unlike anything else in the world. The water is, if you are being very generous, an emerald green. If you’re not feeling gratuitous you would describe the water as dirty. Really dirty. Beauty and the beast or something I suppose. Here is a good look at the boats that you board when you book the 2 day, 1 night cruise. Two days is a little misleading as well. You board the boat around noon and get off the boat the next day at 11am. Less than 24hrs. You spend 8 hours in transit. Here is a picture from their website. I think that some of my disappoint of Halong Bay stemmed from the misleading marketing of the tour rather than Halong Bay itself. Of the hundreds of boats we saw while on our tour I don’t think one looked this nice. Our tour had us boarding the boat right at lunch time and quickly setting sail. Not bad. After a brief and well organized room assignment and check-in the whole boat takes a seat in their dining room/bar for lunch. It’s a boat and so naturally it’s tight. Not a big deal. After the food is put on the table (family-style) the guide starts telling everyone about the islands that we’re passing asking us to get up and look out the window and take pictures and this and that. Everyone looked at each other wondering out loud “does he want us to get up — now?” A quarter of the group got up to look out the window of the dining room on one side of the boat to see a specific limestone tower. The rest stayed in their seats. Kind of weird timing for it all. After climbing just over 400 steps you’re rewarded with spectacular views from the observation deck. 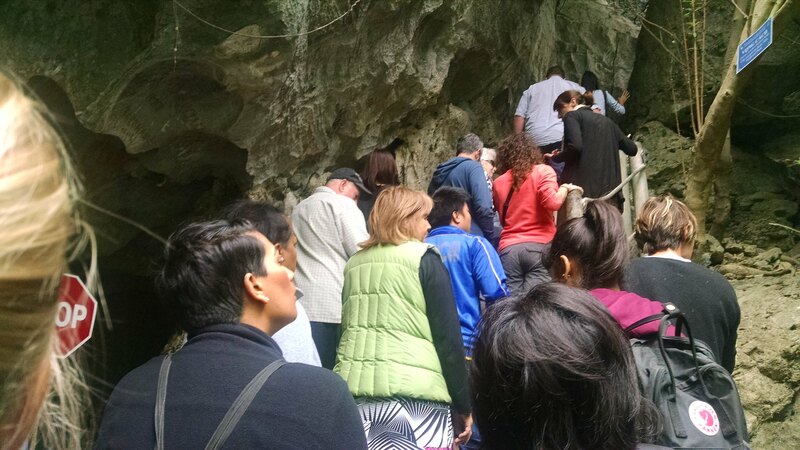 The place was packed with tourists. It was quite the battle to find a spot to take a picture. Not everyone understands the concept of a line. And that’s putting it very nicely. Sunset taken from the top of our boat. A couple of people from the group went out on a mini kayak tour of the bay. We were a little chilly and decided to stay back. Not a terrible idea. The next morning after our breakfast we set sail for a cave. Our guide warned us that it would be packed. This was a picture taken of the line that we were in almost the entire way. Here, unlike the viewing deck, there was no choice but to stay in an orderly line and it actually moved pretty quickly. The caves were gigantic and you didn’t feel the crowds once inside. Our first impression of the caves. Very nice. 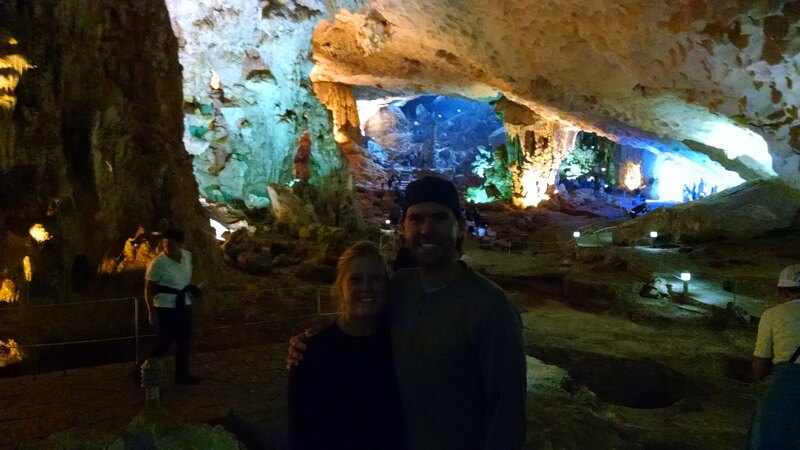 The caves turned out to be my favorite part of the trip. This…..this was straight funny. 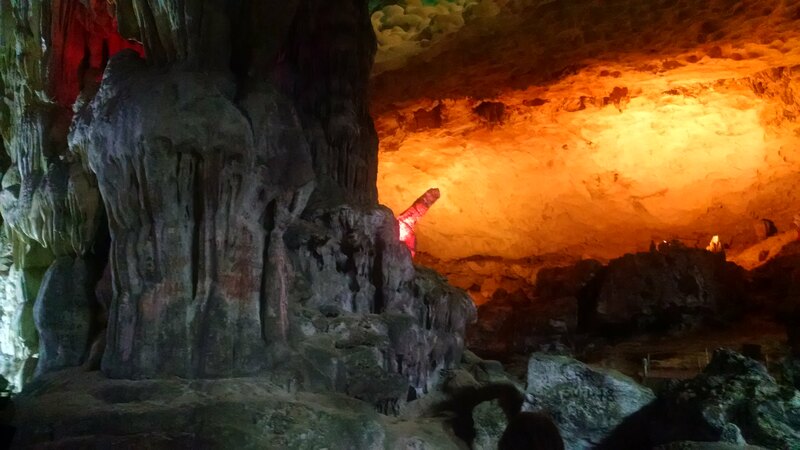 The entrance of the grand finale cave was this well lit “finger” rock. We all enjoyed a good laugh. Lindsay and I hung back a bit and listened to how other guides described the rock while trying to keep a straight face. We’re in the way on this picture. 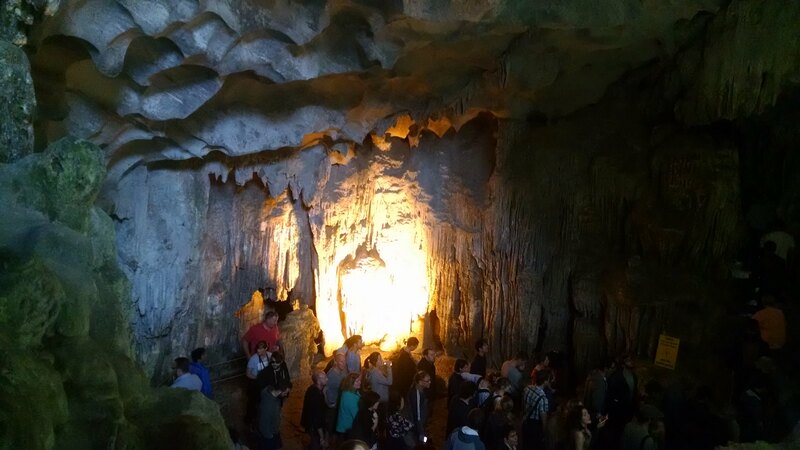 The cave was massive and lit up with different colors. I hope that you can get an idea of how large the space was. The view leaving the cave. 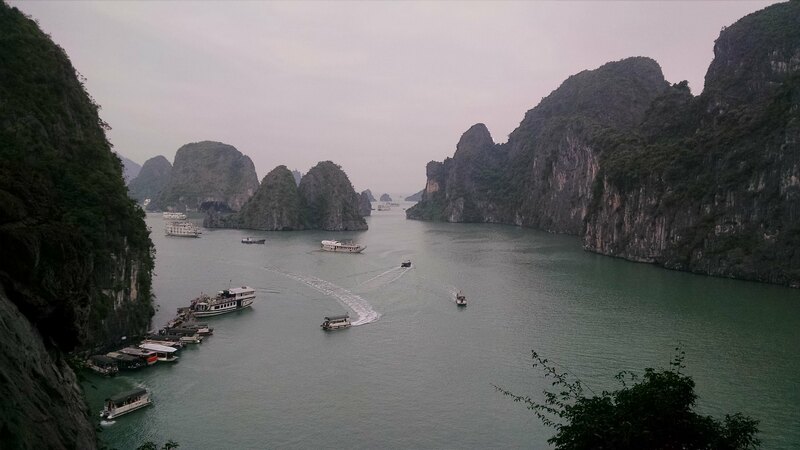 Great picture of the boats, the water and the limestone islands that make Halong Bay..Halong Bay. 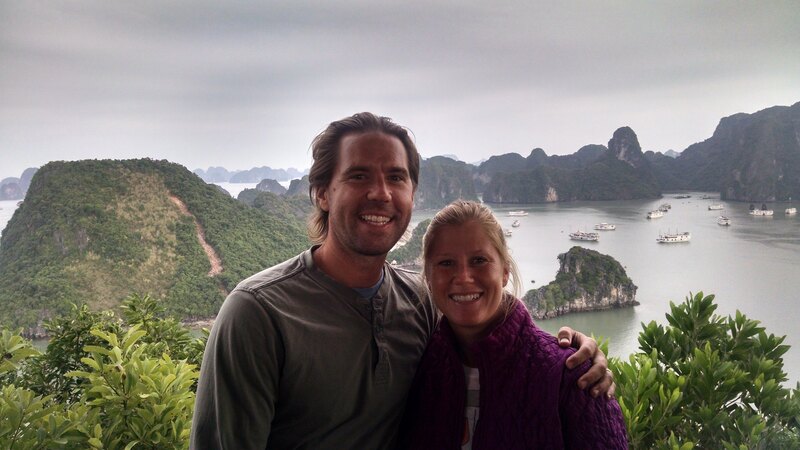 When everything is said and done I am really glad that we came and saw Halong Bay. It didn’t live up to the expectations that I had of it but oh well, we enjoyed our time and I would do it the same way if we had a mulligan.